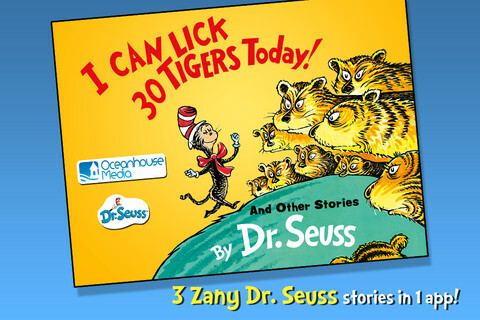 Oceanhouse Media’s I Can Lick 30 Tigers Today!and Other Stories-Dr. Seuss is another fun collection of three short stories to have in your omBook collection. This book was originally back in 1969, so the illustrations show that. Humility, equality, and teamwork are all lessons to learn coming from this collection. 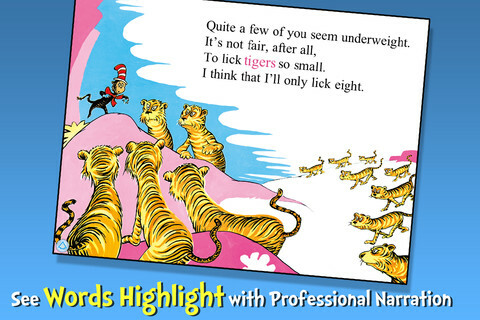 The title story, “I Can Lick 30 Tigers Today!,” is about a character who looks like a small version of The Cat in The Hat and declares that he can lick thirty tigers today! However, as he sees the tigers, he continues to whittle down the number, which immediately made me realize Dr. Seuss’s intention for this story was about the problems of biting off more than you can chew! “King Looie Katz” is all about a fancy cat named Looie who was so proud of his royal tail that he washes it every morning in a ten-gallon golden pail. He also decided his tail should never be allowed to touch the ground, so he requires that Fooie Katz follow him around to keep it from dragging. Before you know it, all but one of the cats are going around keeping each other’s tails from dragging, and this one cat results in a “demo-catic” process. 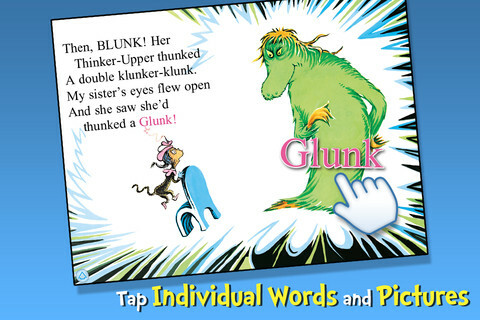 My preschooler loved “The Glunk that Got Thunk” as it is most definitely a wordy Dr. Seuss story. The cat, from the title story, speaks of his sister going upstairs to use her Thinker-Upper. She often thinks of friendly little things, but one night she decides to go for something different and winds up thunking a glunk. This turns out to be a problem, since a Glunk cannot be UN-Thunk and the Glunk calls his mom every night (expensive $10/minute long distance phone call.) And worse off, the Glunk won’t stop talking- hence, the wordy nature of this fun story. This story takes teamwork to UN-Thunk the Glunk! Just like Oceanhouse Media’s other omBooks, you have the options to “Read to Me” (reader turns the pages, sees the words highlighted as they are read by a professional narrator) “Read it Myself,” (like a book where you turn the pages and read on your own with sound effects in the background,) or “Auto Play” (like a movie especially good for the younger audience.) 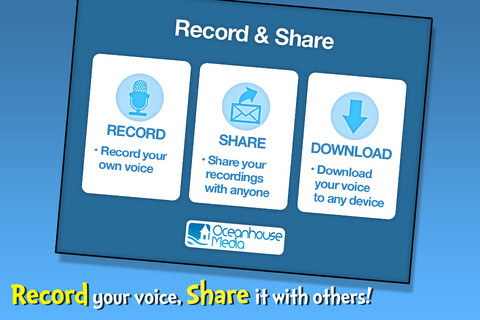 And now Oceanhouse Media also has the special feature “Record your own voice” to their omBooks, as another option to listening to the omBooks with the great narrator. I Can Lick 30 Tigers Today! and Other Stories features a trio of zany tales in verse where we’re introduced to The Cat in the Hat’s extended family. Dr. Seuss teaches us the importance of humility, equality and teamwork. I Can Lick 30 Tigers Today! – A boastful young cat learns the perils of bragging when he overconfidently declares he can lick 30 tigers, then proceeds to whittle down the number. King Looie Katz – King Looie of Katzen-stein proudly gloasts about his royal tail and insists it be carried around so it doesn’t touch the ground. Soon, all cats in the kingdom are carrying around each others tails until one small cat revolts leading to “demo-catic” results. The Glunk that got Thunk – A small cat tells the story of his imaginative sister who “thunked a Glunk.” She tries to “un-thunk” the Glunk who is causing a ruckus, but it takes teaming up with her brother to get rid of the disruptive creature.